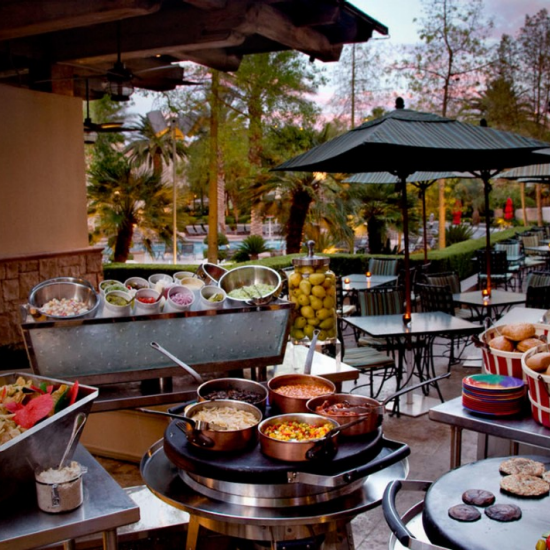 The Cabana Grill is a refreshing take on poolside dining with summer fresh signature dishes and a relaxing atmosphere. Open for breakfast and lunch, this seasonal restaurant and snack bar is the perfect way to satisfy your post-swim cravings. For those looking to get out of the sun, the casual indoor dining area is a great place to grab a bite while you dry off. The Cabana Grill is located at the MGM Grand Pool. Walk into the Casino and at turn right just past Lobby Bar. Continue past Concierge towards KA Box Office. Pass Wolfgang Puck and turn right, towards the District. Continue through the District past PUB 1842 and Grand Garden Arena. Descend the stairs and go through glass doors that lead outside to the pool. Entire the pool via the gates and continue to the left. Cabana Grill will be on your right. Enter the resort from Las Vegas Boulevard. Walk towards Centrifuge and stay to the left passing The Buffet. Continue through the Casino, passing Jabbawockeez Theater. Walk towards Avenue Café. Continue past CRUSH. Turn right when you reach L’atelier and continue through the Casino towards the District Continue through the District past PUB 1842 and Grand Garden Arena. Descend the stairs and go through glass doors that lead outside to the pool. Entire the pool via the gates and continue to the left. Cabana Grill will be on your right.